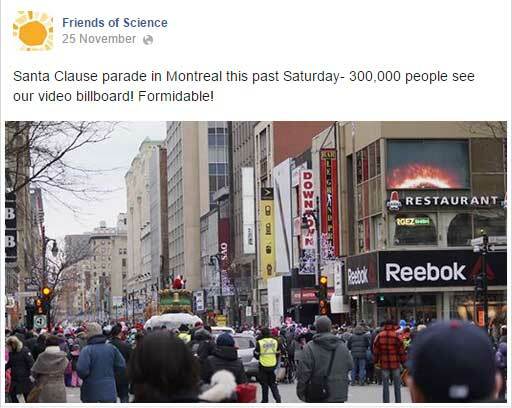 Children attending this year’s Santa Claus Parade in Montreal were trolled by a video billboard at a busy city intersection proclaiming global warming is caused by sunshine. Yes. Sunshine. 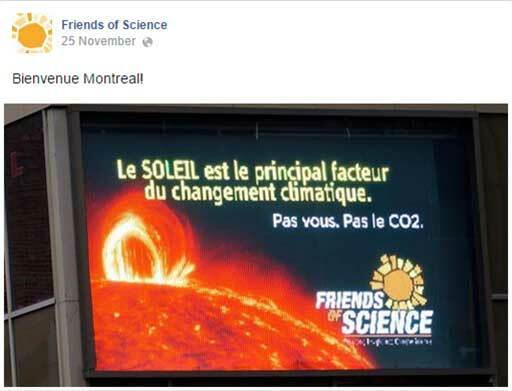 The Quebec media have taken note of the ad, criticizing the science behind Friends of Science’s claims. There’s even a new parody video making fun of the group. But why listen to scientists when you can listen to Friends of Science’s spinner instead? Spokesperson Michelle Stirling-Anosh, who holds a University Certificate in Career Development from Athabasca University, is a former research associate at the Frontier Centre for Public Policy, a right-wing think tank with charitable status. 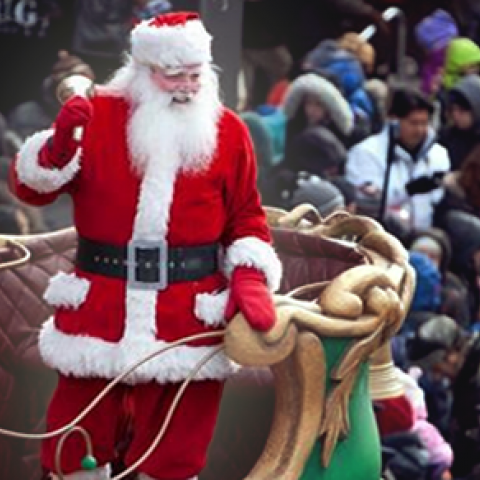 “Two of the most loved stage musicals are set in a background of climate change extremes. The first is “Joseph and the Amazing Technicolor Raincoat.” The drama follows the Biblical story of Joseph and his brothers, in the land of Egypt, where the sun gods of Ra and Horus were worshipped; Pharaoh has a prophetic dream. He asks Joseph to interpret it — seven fat cows were eaten by seven lean and ugly cows. The message was clear. 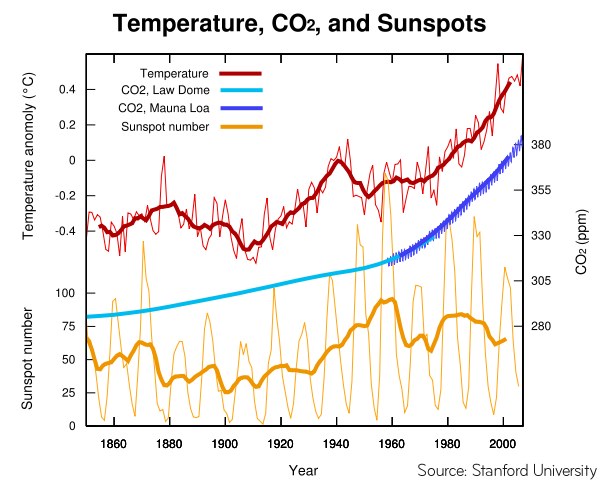 Still, Friends of Science have their share of supporters. That’s right! When Kentucky Fried Chicken pays for a billboard that says “Finger Lickin’ Good,” it sure better BE finger lickin’ good, otherwise they’re going to hear from the Disinformation Police over at the Sierra Club. And they’ll want proof, I can tell ya. Where’s your evidence? Where’s your licked fingers? You got photos of that? 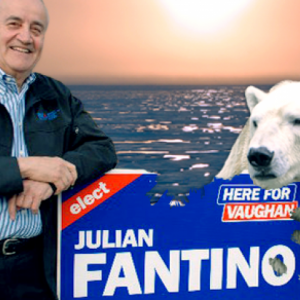 Julian Fantino has had a bad week – a bad year, really. Okay, he’s been downward trending since the day he was elected. With repeated calls for the Veterans Affairs minister to resign after a series of bungles and chatter about a pending Cabinet shuffle, imagine what service Fantino’s “political gifts” could bring to other government portfolios. We enjoy a comedy of Conservative errors, so bring on the shuffle.